The immersive cinematic experience is influenced by many factors, including, but not limited to, the production, narrative, technology and screening environment of the film. Since the introduction of digital cinema, directors have provided increased immersion through 3-D imagery and immersive 3-D sound technologies. Despite excitement in the production industry, new immersive technologies are being introduced into the cinema exhibition space with caution. Cinema managers are not rushing to upgrade to new technologies despite increased production of 3-D and immersive sound films. The cost of upgrading equipment, and with many new technologies not yet standardised, makes any technological investment a costly risk. This risk also factors in audience (customer) demand. John Kellogg warns that the immersive technologies need to be affordable for theatre owners, if not they will invest in upgrading their chairs (Giardina 2014). This cautious approach to upgrading technology is reminiscent of the format war that occurred during the introduction of wide screen and Cinerama. With 3-D introduced to bring the audience back to the cinema, how much of an attraction are immersive exhibition formats? Many are now stating that the 3-D experience is underwhelming, especially considering the premium price of tickets. In addition to changes in digital vision technologies, the digital soundtrack is also undergoing development with competing immersive sound formats vying for cinema standardisation. 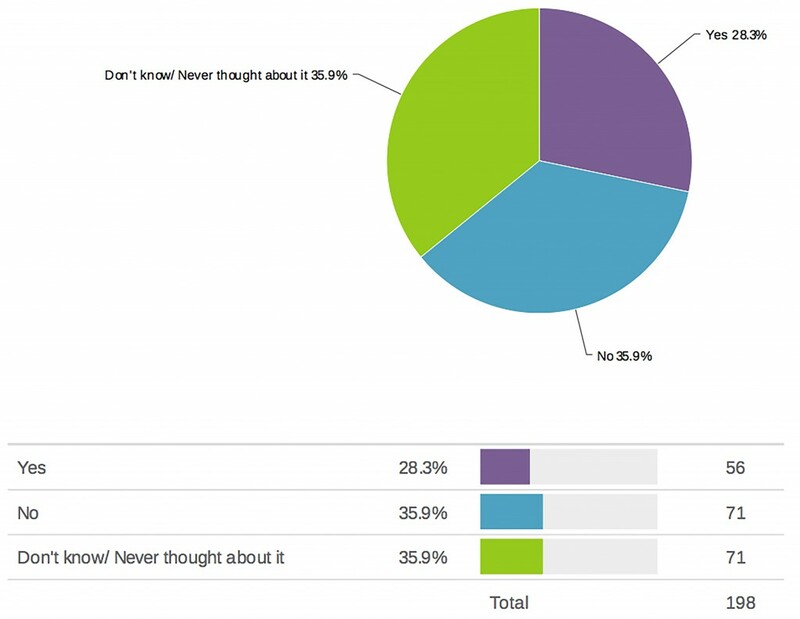 During 2014, the author conducted an online survey with 201 participants to investigate audience awareness of contemporary and emerging cinema technologies. This paper analyses the results and identifies audience literacies of contemporary cinema technologies and formats. Although vendors are pushing the benefits of their new technologies, what influence does the audience have? Is the audience demanding more from the cinema? What is the technical literacy of the cinema audience? Does the cinema audience understand the differences in new immersive technologies, including the immersive sound formats, or is contemporary cinema exhibition adequate? Cinema provides the initial exhibition medium for a completed film production, and it is here, at the box-office, that the success of a Hollywood film is often initially judged. Although film revenue continues to be generated long after a film has left the cinema, through various domestic releases and ongoing broadcast and online distribution, it is ultimately the cinema release that is used as the initial benchmark for a films’ success. Cinema owners are constantly anticipating audience trends in order to increase revenue generation. Ultimately the scope of any technological upgrade depends upon cinema owners taking risks by investing in new technologies and anticipating audience demand for such technologies. Audiences have many choices when it comes to consuming media, with personal devices, domestic 3-D television, and the introduction of low-cost virtual reality providing affordable immersive alternatives to the cinema. Broken into two parts, this paper will investigate: the uptake of immersive technologies by cinemas; and the cinema audience and its understanding of immersive technologies. Investing in technological upgrades provides a challenge for cinema managers as competing formats and revenue forecasts need to be considered. Films are being created in 3-D and with immersive sound, and cinema managers need to determine if upgrading to these new exhibition formats is a worthwhile investment, or if the money could be better spent elsewhere. Kellogg cites ‘The Wall Street Journal recently reported that AMC is spending $600 million on larger, fully reclining seats’ (Giardina 2014). In 2005, three of the world’s best known directors—George Lucas, James Cameron, and Robert Zemeckis—appeared at the ShoWest convention, hosted by the National Organization of Theatre Owners (NATO). The mission of these industry icons was to advocate for the transition to digital cinema, with the anticipation that they could grow cinema audiences and increase cinema revenue. It was here that Cameron made the promise that digital 3-D was the future that would ‘get people to come out from behind those HD flat-screen TVs and into the theatres’(Bordwell 2012, 66). The prediction proved to be correct with Chicken Little (Dindal and Kennedy 2005), the first 3-D Disney Animation Studios feature, having an average seat occupancy of 96% over the opening weekend (Mendiburu 2009, 5). It did not take long before all three directors delivered on their vision. Only two years later Zemeckis’ Beowulf was released (Gaiman and Avary 2007) followed by A Christmas Carol (Zemeckis 2009), both in 3-D and both strong performers at the box office. Cameron’s iconic 3-D flagship film Avatar (Cameron 2009), yielded the most revenue (in unadjusted dollars) of any film in history (Bordwell 2012, 66). Although not originally a 3-D release, the Star Wars series was 3-D post-converted and rereleased after Lucas saw the rewards being offered. Cameron also 3-D post-converted Titanic (Cameron 2012), 15 years after the original and a century after the historic ship’s sinking. The worldwide box office grosses of 2013 highlighted the resurgence of 3-D, with thirteen of the top fifteen films being 3-D releases. Of these thirteen 3-D films, three were animated, two were live-action 3-D native and the remaining eight were 3-D post-converted films (Box Office Mojo 2014). By the end of 2013, 3-D film revenue in the United States/Canada was 16 per cent of total film revenue, after reaching a high of 21 per cent in 2010 (Motion Picture Association of America 2015, 9). For a cinema to be able to exhibit digital 3-D content, 3-D digital projection is needed. In 2011, cinema growth increased by 3% worldwide, with double-digit growth in the Asia Pacific region. Globally, over the past few years, cinemas have increased their adaption to digital screen technologies. Throughout the United States and Canada, the number of analogue screens decreased from 14,921in 2011 to 1,109 screens in 2015. Conversely, digital screens increased from 13,774 non 3-D in 2011 to 26,111 non 3-D in 2015, and from 13,695 3-D screens in 2011 to 16,441 3-D screens in 2015 (Motion Picture Association of America 2016, 6). In Australia, analogue screens decreased from 1534 in 2011 to 901 in 2015 and digital screens increased from 704 in 2011 to 1179 in 2015 (Screen Australia 2016). With 3-D films demanding a premium surcharge, United States consumers decided the visual gimmick was not worth paying an extra $2 to $5 per ticket (Barnes 2013). Barnes suggests that although cinema numbers were growing, this may not have resulted exclusively from 3-D releases. Turbo (Lemke and Siegel 2013) set a new industry low for the format. According to analysts, 3-D screenings accounted for only 25% of its opening-weekend results (Barnes 2013). The decline in 3-D ticket sales may be a reflection on the quality of the films available at the time, as opposed to the 3-D medium itself. Gravity (Cuarón and Cuarón 2013), with seven Academy Award® wins and another three nominations, generated almost US$100 million from the box office after only two weeks. The initial success of 3-D, and the number of 3-D released films, gave cinema managers confidence in digital projection upgrades. Managers are constantly weighing up the risks involved in technological advancement and Bordwell (2012, 8) acknowledges that although film technologies are introduced into the production sector, exhibitors often resist them. As noted by Bordwell, this is a costly gamble because ‘if the technology doesn’t catch on, as 3-D didn’t in the 1950s, millions of dollars can be wasted’ (Bordwell 2012, 8). Despite upgrading to digital screens, cinema managers have been cautious in upgrading their sound systems to the next generation of immersive sound formats including Auro and Dolby Atmos. In either an 11.1 or 13.1 configuration, the Auro 3-D concept is not object-based, instead building upon the traditional 5.1 format with an additional height and an additional ceiling layer, providing a three-tiered format. Dolby Atmos is a hybridised format based on a combination of traditional sound beds and the addition of ‘object based’ sound. Traditional sound formats use sound beds where all panning has been committed during the mixing phase of film production. The ‘object based sounds’ in Dolby Atmos, however, contain meta-data that is used, based on each individual cinema configuration, to calculate the panning of these additional objects during exhibition. It is also appropriate to recognise a third format, Iosono 3-D. Significantly, Iosono 3D uses wave field synthesis (WFS) technology to create virtual wave fronts that enable the localisation of virtual sound sources, regardless of the listener’s position. The Iosono system uses many speakers spread equidistant across a horizontal plane around the perimeter of the cinema, creating a 360˚ array. To date, mainstream cinema has not embraced the Iosono holographic sound technology. Iosono struggled to gain the traction it had originally hoped for. With only seven installations worldwide, the company was declared insolvent in February 2014 (Iosono 2014) before being acquired by Barco on the September (Barco 2014). Sound technology vendors hoped to provide the preferred 3-D film sound solution and began introducing the sound industry to their respective technologies long before the cinema owners and the general public became aware of the formats. These vendors anticipated that if they could gain loyal expert endorsement for their format, it would help them sell to film directors, producers, studios and more importantly, the cinema owners. As Bordwell suggests (2012, 76), the cinema owner has the most to lose if a new technology fails to catch on. This was demonstrated between the 1970s and the 1990s with owners resisting the parade of digital sound systems including Sensurround, Dolby Stereo, Dolby Stereo 70mm, Dolby SR, Dolby Digital, DTS and Sony SDDS. Barco, the company best known for its cinema projectors, established Auro 3-D in 2011. Claiming to produce 3-D sound using a 3-layered sound field, the Auro 3-D system has seen gradual adoption by industry. Auro cinema installations surpassed 550 in 2015 and this number is continuing to grow. Many films are opting to have an Auro release in addition to the traditional 5.1 or 7.1 soundtracks. 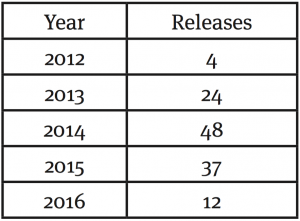 The table below shows the number of Auro format releases between 2012 and 2016 (Barco 2016). Wim Buyens, senior vice president of Barco’s Projection Division, points out that Auro was proud of its industry infiltration (Film Journal International 2013). Barco is known for its projector technologies, so gaining recognition for the Auro audio technologies has proved challenging. This is in contrast to Dolby, a company renowned for audio innovation. Introduced in April 2012, Dolby Atmos signalled the most publicised introduction of a new emerging cinema sound technology to date. As Nicholson states, Dolby provided this through creating partnerships with cinemas to push the message that 3-D sound is the future of movies (Nicholson 2012, 3). 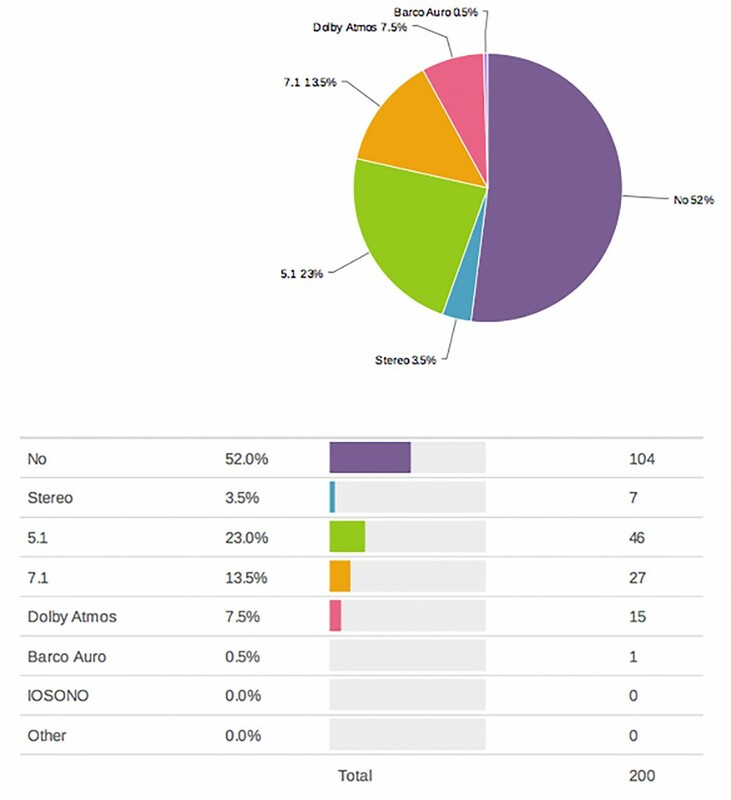 Research into media coverage showed that Dolby Atmos gets 83 per cent coverage compared to 17 per cent for Auro. This includes articles in Time, USA Today, ET Weekly, NY Times and Bloomberg. In February 2014, there were 450 screens worldwide equipped with Dolby Atmos, and this number has exploded to 1600+ (as of April 2016). The number of films released in Dolby Atmos has also quadrupled since the release of Godzilla (Borenstein and Callaham 2014), going from 100 releases to 400+ (Bowling 2016). There are more than fifty studios equipped to provide the mixing of films in the Dolby Atmos format, compared to twenty-six Auro 11.1 equipped mixing facilities worldwide, with the majority based in the United States. Although both immersive sound technologies are being marketed with 3-D films, Dolby Vice President Ioan Allen states that he does not want Dolby Atmos to be associated with 3-D exclusively, believing that it can work for any movie. ‘Coming up with a format that can be universally adopted and is not just tied to some ‘boutique’ experience is something that we’ve done very consciously in the past’ (Fuchs 2012, 7). ‘In February 2013, the National Association of Theatre Owners and the Union Internationale des Cinemas (UNIC) released cinema exhibitor requirements for immersive sound technologies to ensure that any audio rendering system that an individual cinema may choose is capable of playing back immersive sound when a studio releases it. Numerous stakeholders believe the current lack of consistency is holding back a wider immersive sound rollout’ (Giardina 2015). Further complicating the decision to upgrade to immersive sound is the fact that Dolby Atmos and Auro 11.1 systems share little in common, including the final film soundtrack deliverables and the cinema speaker and hardware configurations. John Kellogg warns that the immersive sound business needs to be affordable for theatre owners; if not, they will invest in upgrading their chairs (Giardina 2014). An upgrade to immersive sound is estimated at between US$35,000 to well into six figures, making the investment a serious consideration. Until mid-2014, the only installations of immersive cinema sound technologies in Australia were two Titan XC auditoriums owned by Reading Cinemas. Hedging their bets, their first installation was the Auro 11.1 format in Townsville Queensland, and the second installation was the Dolby Atmos format at their Waurn Ponds cinema in Victoria. Both Reading Cinemas, however, state that their respective sound systems offer ‘full 360˚ immersive sound’(readingcinemas.com.au 2014). Around the same time, a third installation, featuring a Dolby Atmos format, was installed at Village Cinemas within the Crown Casino, Melbourne (Simpson 2014). In October 2014, AHL announced it was about to invest in 20 Dolby Atmos installations in its Village cinemas across Australia (IF 2014). The number of immersive sound installations has grown in the past couple of years, and as of April 2016, there were 12 Dolby Atmos cinemas in Australia (Dolby 2016). Australians are mostly unaware of immersive sound formats as publicity remains limited, and there are a limited number of immersive cinema installations and film releases. However, publicity is beginning to grow. 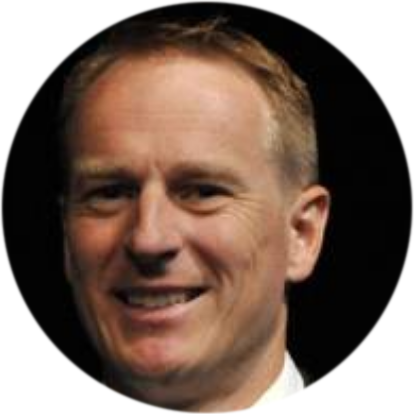 David Lovell, Manager of Reading Waurn Ponds, is positive that increasing publicity ‘may actually make people aware of how good sound can be, and raise awareness of new technologies in sound, such as Dolby Atmos’ (Lovell 2014). Although actively participating, is the audience aware of differences in cinematic listening environments? On a field trip to the Reading Cinemas, Waurn Ponds, in January 2014, the author questioned cinema manager, David Lovell, about the audience awareness of the Dolby Atmos system, and how his patrons perceived this. Lovell’s reiterated the perception of vision being the dominant medium. Cinema owners prioritise profit over content, as noted by the Reading Cinemas managers at Waurn Ponds and Townsville cinemas. In personal telephone conversations, each independently discussed that not all films are shown in 3-D when screened using immersive sound formats. For example, on Wednesday 11 December 2013, each cinema was screening Enders Game (Hood 2013) in Dolby Atmos and Auro, although the film was not a 3-D release. Both stated that it is common for immersive sound films to be bumped out of Reading’s premium branded Titan XC auditoriums for non-immersive sound format films. It is not the film format exclusively that determines if a film will run in their immersive sound equipped auditorium; rather, the determining factor is projected ticket sales. Reading Cinemas is proud of its flagship Titan XC auditoriums as they have the latest in technologies, including immersive sound and the largest screens; and can also seat the largest audience. Revenue generation is prioritised, despite a film having a Dolby Atmos or Auro release. If another film release without immersive technologies will sell to a larger anticipated audience, then the immersive format film will be rescheduled to a non-Titan XC auditorium. As a result, the premium immersive sound of these films will not be compatible with the playback system in the smaller auditorium necessitating the playback of a conventional 7.1 or 5.1 soundtrack. Keeping in mind the reluctance of cinema owners to take up immersive audio technologies, I now provide the survey results about cinema audience understandings of immersive technologies. For a cinema to warrant upgrading technology, an increase in revenue needs to be forecast, and this relies largely on audience patronage. This section questions the role that the cinema audience plays in determining future technological adaptations. This requires that an audience not only attend a cinema, but also be literate in identifying advantages of the cinematic experience, based on particular technological improvements. During 2014 I conducted an online survey to determine audience awareness of current and emerging cinema technologies. This information provides an insight into how an audience may make decisions based on a particular cinema or a particular technology. Although industry may be determining the future of film technologies, it is important to compare these changes with customer expectations. The survey aims to identify the cinematic technical literacy of an audience, including understanding of contemporary film sound formats and 3-D technologies. It also seeks to find out if an audience may select a particular film or cinema based on the exhibition format. An online survey was created using the online tool SurveyGizmo. An electronic invitation seeking participants was sent via film industry mailing lists, academic mailing lists and via social media platforms. The survey conducted may have some limitations. For instance, although having 201 participants, many were based in Australia, and at the time of the survey, Australia only had two immersive sound installations, limiting the number of participants who had experienced these formats. Another limitation was that survey questions could be skipped. The following figures outline the breakdown of participant demographics. The source country of the sample was 80% (162) from Australia, 9% (18) from the US, 2.5% (5) from the UK, 1.5% (3) from India, 1% (2) each from Canada and Germany and one respondent each from Belgium, France, Italy, Mexico, New Zealand, Singapore, Spain, Sweden and Switzerland. Of these, 63% (126) identified as being male, 37% (73) as female and one participant as other. 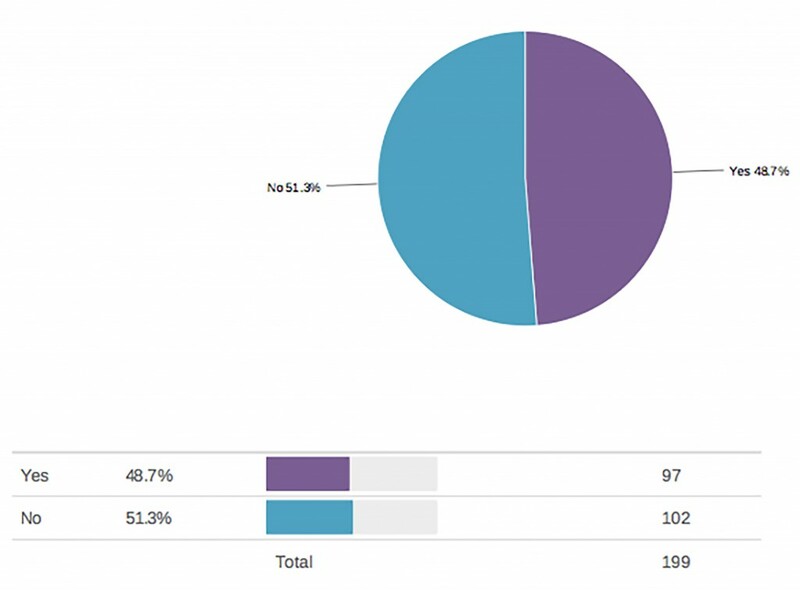 Of the 201 participants, over one third (36%) self-reported as working in the film industry. 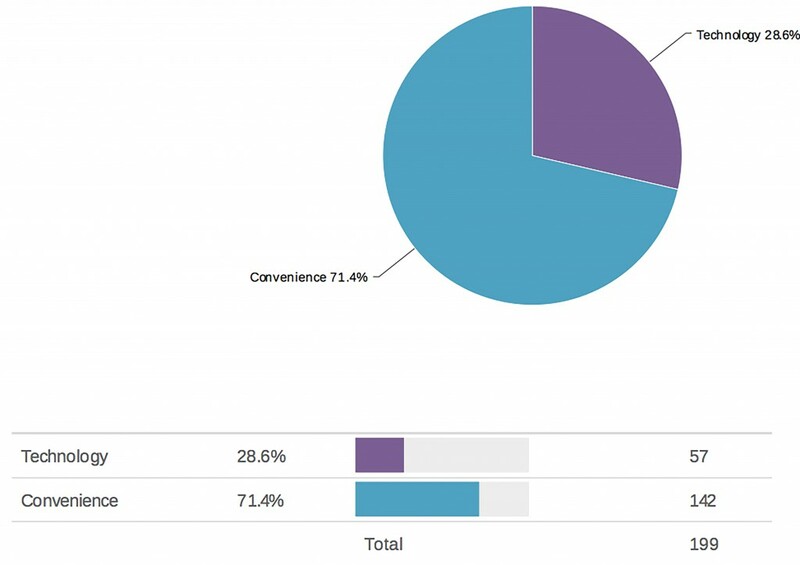 When asked how audience members select a particular cinema, 71.4% of participants prioritise convenience over technical capabilities (Figure 1). The introduction of digital 3-D films has resulted in audiences paying a premium surcharge for the 3-D cinematic experience, but do audiences consider this worth paying for? When asked if participants were willing to pay this surcharge, responses were fairly evenly split (Figure 2). Figure 2: Do participants accept paying a premium surcharge for 3-D films? 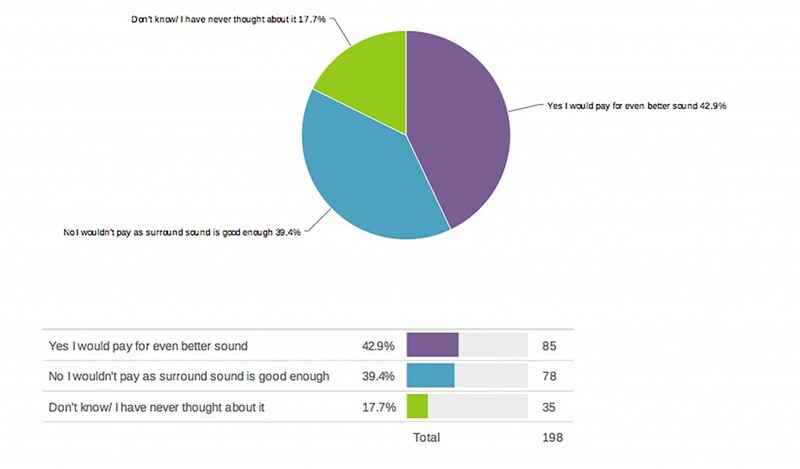 However, when asked if they would pay a surcharge for a superior sound experience, to contemporary 5.1 or 7.1 sound, 43% of participants agreed and 17% said they didn’t know (Figure 3). Figure 3: Would audience members pay a surcharge for a superior sound experience? Lovell’s observations in regard to relating to the visual over sound (2014) align with the following survey results. Asked about their knowledge of the sound format of the most recent film they had seen, over 50% of participants were unaware (Figure 4). Figure 4: Was the participant aware of the sound format of the previous film they had experienced? If so, what was it? Many cinemagoers are able to recognise whether or not a particular film ‘sounded great’, but how many would prioritise a cinema with good sound over a cinema with good visuals? The survey results indicate that 54% of people would prioritise a cinema with good sound over good image (Figure 5). Figure 5: Graph showing audience priority in selecting a cinema based on sound or image quality. The results are surprising given that 50% of participants reported being unaware of the sound format experienced with the most recent film they had seen, as suggested earlier (Figure 4). 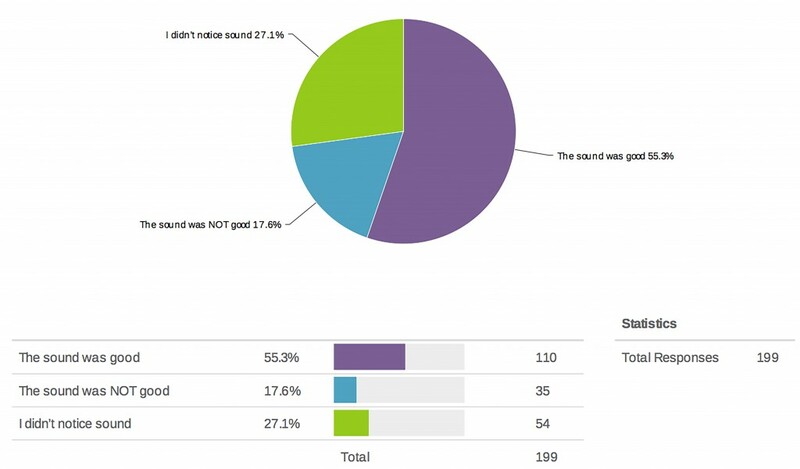 However, when also asked about the quality of sound for the most recent film they had seen, nearly 30% of participants didn’t even notice the sound quality (Figure 6). Figure 6: Graph showing participants’ opinions about the quality of sound on the last film that they experienced. Participants were asked if they thought surround sound is the same as 3-D sound. 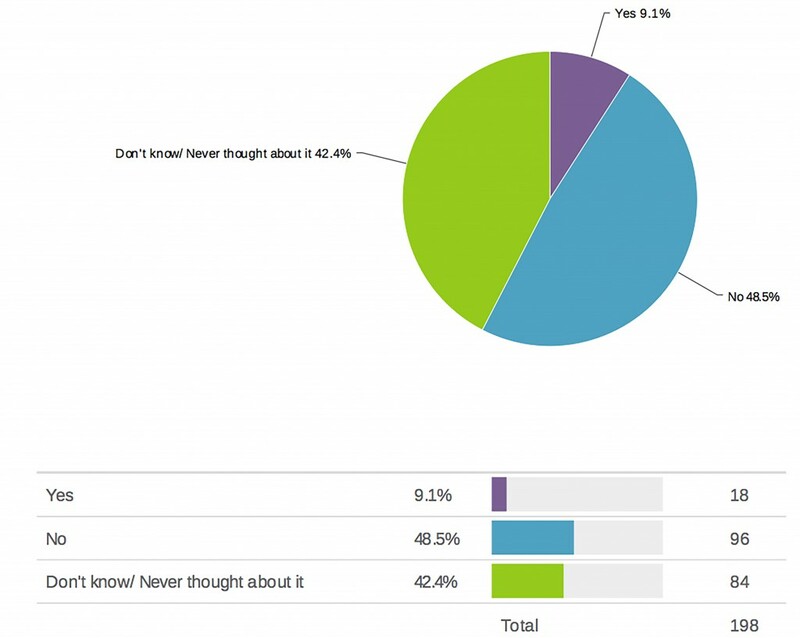 Only 9.1% thought so, although over 40% of participants didn’t know or had never thought about it (Figure 7). Figure 7: Is surround sound the same as 3-D sound? The definition of 3-D sound is clearly misunderstood as participants were also asked if they thought sound for 3-D films could be called 3-D sound. Regardless of the soundtrack being stereo, surround or immersive sound, some 28% of participants thought that a soundtrack associated with a 3-D film was 3-D sound and 36% did not know (Figure 8). Figure 8: Can the sound for a 3-D film be called 3-D sound? These results provide a broad overview of the technical understanding participants have for contemporary cinema technologies and formats. This includes surround sound formats and 3-D sound and imagery. The survey results indicate that the majority of participants would select a cinema based on convenience rather than technical capabilities. 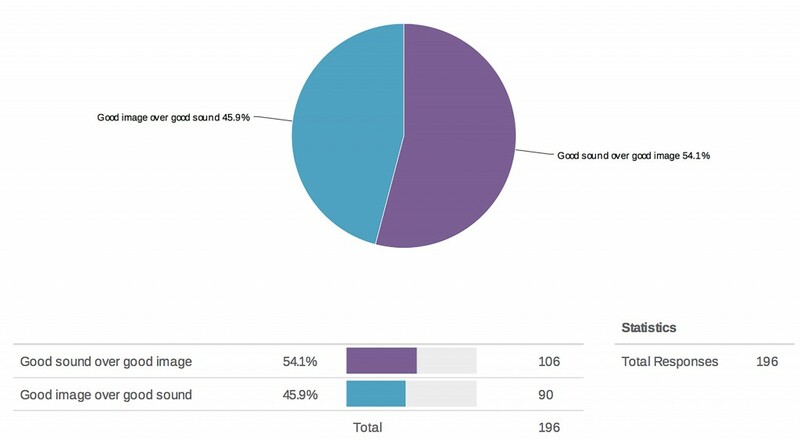 The results also indicate that audience members have some awareness of the importance of soundtrack and sound formats since over half the participants prioritised good sound over good imagery. Despite this, and given that over one third of participants work in the film industry, the survey also suggests that participants are largely unaware of the various sound formats. Sound plays an important role in film, whether consciously noticed or not. Randy Thom believes that film is definitely not a visual medium, stating that, ‘If you look closely at and listen to a dozen or so of the movies you consider to be great, you will realise how important a role sound plays in many if not most of them’ (1999, 3). This creates a difficult situation for cinema managers—although audiences may not be aware of each particular sound format, they are very aware when sound fails. Doane suggests that ‘the invisibility of the work on sound is a measure of the strength of the soundtrack’ (1985, 54). This is echoed by Will Files in stating ‘we are an invisible art’ (Giardina 2014). The survey results confirm Lovell’s suggestion (2014) that provided that the picture plays clearly, is framed on the screen, and the sound is intelligible, the general audience is content, and unaware of, and illiterate in, specific cinema technologies. With survey participants confused if surround sound is 3-D sound, and whether the soundtrack for a 3-D film can be called 3-D sound, it is clear that there are limitations to a cinema audience’s understanding of contemporary film formats. This also indicates that audiences are still content with contemporary cinema sound technologies. This may also confirm as valid the hesitation by cinema managers to upgrade to immersive sound technologies. This paper provides a brief investigation on the adaptation of digital screens and immersive sound technologies by cinemas, with Australia as a case study. However, the cinematic market uptake of immersive technologies appears to have stalled. This research suggests two possible reasons. First, cinema owners are reluctant to install expensive immersive cinema technologies, and second, an online survey indicates that good quality sound is not a high priority for cinema audiences. More research will need to be conducted to determine if these factors will be endured over time or not. Significant investment is required for a cinema to upgrade to emerging technologies and the survey results endorse the reluctance of the cinema manager to upgrade because of the disinterest and illiteracy of the audience in regard to specific cinema and immersive technologies. Barco. 2014. “Barco Gains the Team and Expertise from IOSONO GmbH to Further Enhance the Immersive Sound Experience in Cinemas Worldwide”. Press Release September 24. http://www.barco.com/en/News/Press-releases/Barco-gains-the-team-and-expertise-from-IOSONO-GmbH-to-further-enhance-the-immersive-sound-experienc.aspx. Barnes, Brooks. 2013. “Huge Summer for Hollywood, but with Few Blockbusters”. The New York Times, September 1, sec. Business Day / Media & Advertising. http://www.nytimes.com/2013/09/02/business/media/huge-summer-for-hollywood-but-with-few-true-blockbusters.html. Bordwell, David. 2012. Pandora’s Digital Box: Films, Files, and the Future of Movies. http://www.davidbordwell.net/books/pandora.php. Borenstein, Max and Dave Callaham. Godzilla. 2014. Directed by Gareth Edwards. Burbank, CA: Warner Bros.. Bowling, Stuart. 2016. Dolby. https://www.linkedin.com/hp/update/6127870785852887040. Box Office Mojo. 2014. “2013 Yearly Box Office Results”. Box Office Mojo. http://boxofficemojo.com/yearly/chart/?view2=worldwide&yr=2013&p=.htm&utm_content=buffer9e9ac&utm_source=buffer&utm_medium=twitter&utm_campaign=Buffer. Cameron, James. Avatar. 2009. Directed by James Cameron. Century City, CA: Twentieth Century Fox Film Corporation. ______Titanic (3-D Version). 2012. Directed by James Cameron. Hollywood, CA: Paramount Pictures. Cuarón, Alfonso and and Jonás Cuarón, Gravity. 2013. Directed by Alfonso Cuarón. Burbank, CA: Warner Bros. Pictures. Dindal, Mark and Mark Kennedy. Chicken Little. 2005. Directed by Mark Dindal. Burbank, CA: Buena Vista Pictures Distribution. Doane, Mary Ann. 1985.”Ideology and the Practice of Sound Editing and Mixing”. In Film Sound: Theory and Practice, edited by Elisabeth Weis and John Belton. New York: Columbia University Press. Film Journal International. 2013. “Auro 11.1 Sound Exceeds 50 Film Releases”. June 26. http://www.filmjournal.com/filmjournal/content_display/news-and-features/news/technology-and-new-products/e3i280b0b4c0471e0eec77cd1a9f0825b26. Fuchs, Andreas. 2012. “Soundsational!” Film Journal International 115 (5): 66. Gaiman, Neil and Roger Avary. 2007. Beowulf. Directed by Robert Zemeckis. Hollywood, CA: Paramount Pictures. Giardina, Carolyn. 2014. “Randy Thom Urges Directors, Screenwriters to ‘Create Moments’ for Immersive Sound”. The Hollywood Reporter. http://www.hollywoodreporter.com/behind-screen/randy-thom-urges-directors-screenwriters-730846. ——. 2015. “NAB: Can Hollywood Avoid an Immersive Sound Format War?” The Hollywood Reporter. http://www.hollywoodreporter.com/behind-screen/nab-can-hollywood-avoid-an-787982. Hood, Gavin. 2013. Ender’s Game. Summit Entertainment. IF. 2014. “AHL to Roll out 20 Dolby Atmos Screens in Australia”. October 13. http://if.com.au/2014/10/12/article/AHL-to-roll-out-20-Dolby-Atmos-screens-in-Australia/FUAVWYYEEA.html. Iosono. 2014. “IOSONO Starts Investor Talks”. Iosono Sound. February 24. http://www.iosono-sound.com/news/detailansicht/iosono-starts-investor-talks/. Lemke, Darren, Robert D. Siegel and David Soren. 2013. Turbo. Directed by David Soren. Century City, CA: 20th Century Fox. Lovell, David. 2014. Reading Cinema Waurn Ponds Dolby Atmos installation. Personal Interview with author. Mendiburu, Bernard. 2009. 3D Movie Making Stereoscopic Digital Cinema from Script to Screen. Amsterdam; Boston: Focal Press/Elsevier. ______ 2015. Theatrical Market Statistics 2014. http://www.mpaa.org/wp-content/uploads/2015/03/MPAA-Theatrical-Market-Statistics-2014.pdf. Nicholson, Amy. 2012. “Making a Reality a Reality”. Boxoffice 148 (7): 29-30, 32.
readingcinemas.com.au. 2014. ‘Reading Cinemas Townsville’. Accessed October 16. http://readingcinemas.com.au/locations/theatre/townsville. Screen Australia. 2016. “Screens and Theatres – Industry Trends – Cinema – Fact Finders”. Screen Australia. http://www.screenaustralia.gov.au/fact-finders/cinema/industry-trends/screens-and-theatres. Sergi, Gianluca. 2001. “The Sonic Playground: Hollywood Cinema and Its Listeners”. In Hollywood Spectatorship: Changing Perceptions of Cinema Audiences, edited by Melvyn Stokes and Richard Maltby. London: BFI Pub. Simpson, Campbell. 2014. Dolby Atmos is Coming to Australian Cinemas. June 3. http://www.gizmodo.com.au/2014/06/dolby-atmos-is-coming-to-australian-cinemas/. Thom, Randy. 1999. ‘Designing A Movie for Sound by Randy Thom’. http://www.filmsound.org/articles/designing_for_sound.htm. Zemeckis, Robert. 2009. A Christmas Carol. Walt Disney Studios Motion Pictures.